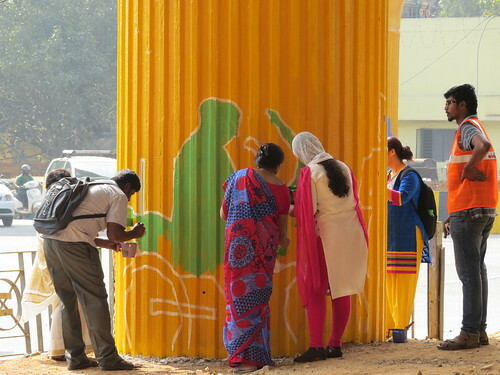 to photo-document the process of creating silhouettes so that citizens could claim the public space under the flyovers that dot our city. Unfortunately, my acceptance was emailed to the wrong id, but when Archana of Jaaga contacted me and asked me if I could come on the 26th of January, I readily agreed. 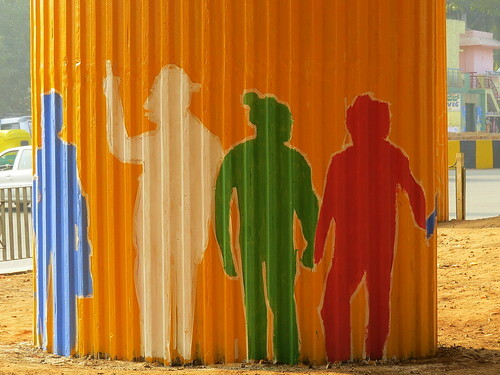 Silhouettes were chosen by Jaaga as a way of representing both a particular citizen, and the city’s people, in general. 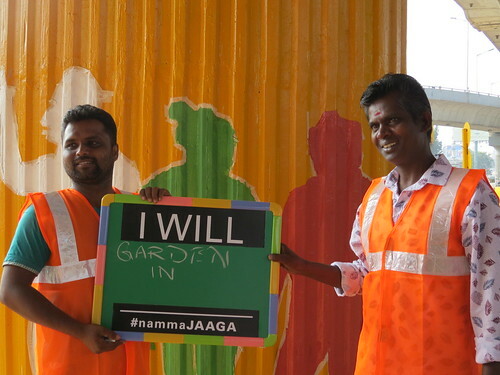 “Jaaga wants to address urban issues through community art,” says Kamya Ramachandran, Director, JaagaDNA, one of the three arms of Jaaga . ( Mansi Kashatria tells me that the other two are Start-ups and Study). 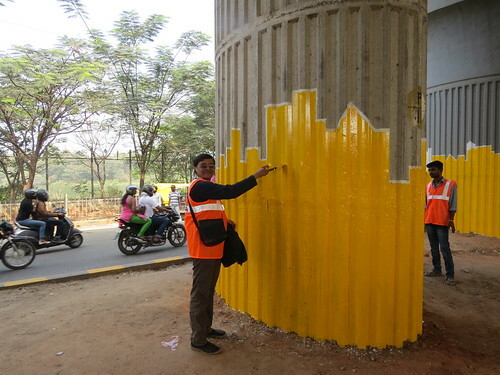 The process of making the silhouettes involved shining a bright light at a person, throwing a shadow on the pillars of the flyover. The outline would be defined by mask tape, and would later be filled in by paint: Black, white, blue, yellow, red, and green. 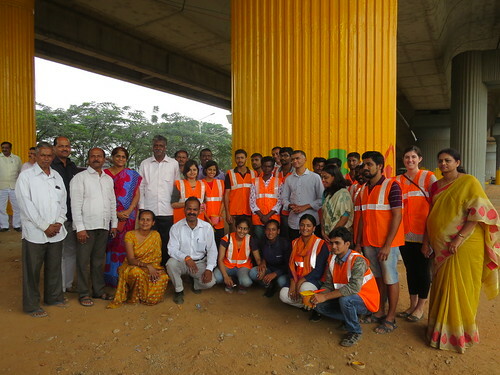 Having seen the work done at the Richmond Flyover, I set off for Hebbal early in the morning. 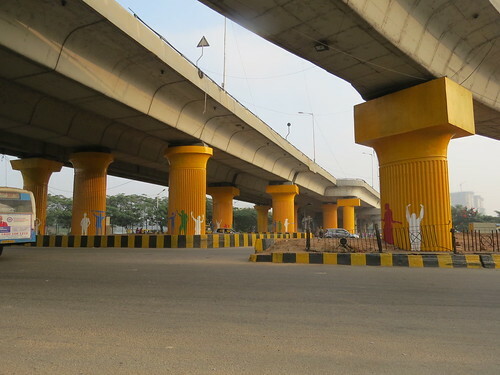 As I approached the flyover, I saw some of the silhouettes that had been done on Saturday, the 23rd January. Mansi and Kamya of JaagaDNA were supervising the unloading of the art material, and these used mugs looked quite artistic! 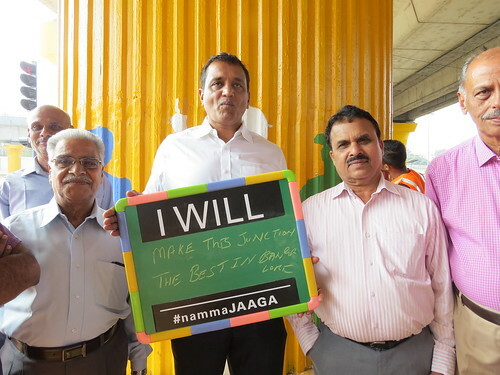 “We have so many ‘don’ts’ about traffic and crossing the road...so we thought we could ask the people about the ‘do’s’...what they’d like to do with public spaces,” remarks Kamya. 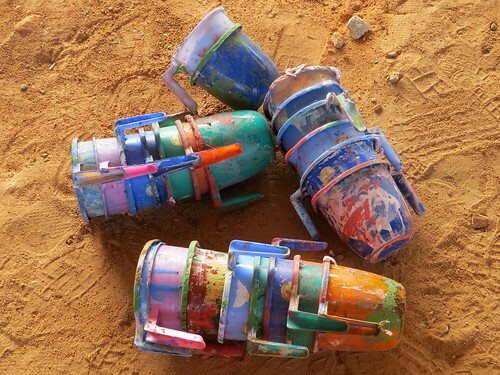 The painters, including Badri and Mahesh, mixed the paint, ready for use. A wide variety of people held up messages that expressed their way of claiming the space. The LGBT community, which had actively helped in the lighting and masking process on Saturday, had both dreams and practical requests for the space. 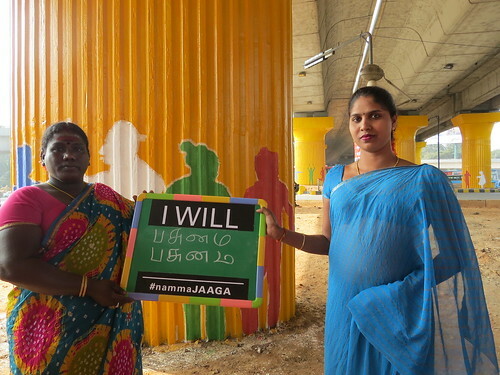 Here, Lalitha and Archana ask for “pasumai” (Tamil for greenery). Here, they ask for drinking water and a toilet to be provided. 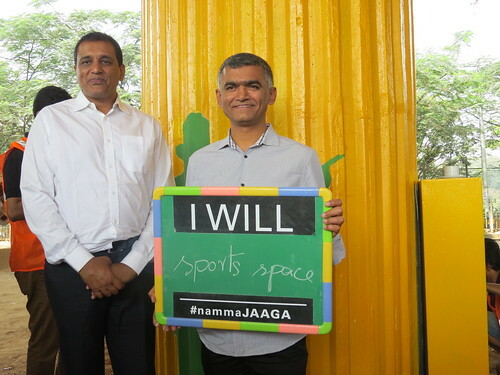 The Commissioner himself had an ambitious dream for the space: Here’s the Minister’s way of using the space: Others who were not luminaries were an integral part of the event, too. Here’s the gentleman who was clearing up the used cups, because several people were, thoughtlessly, littering. 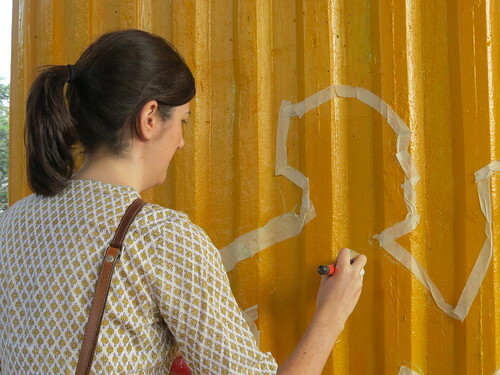 So many people painted in the spaces blocked on Saturday. 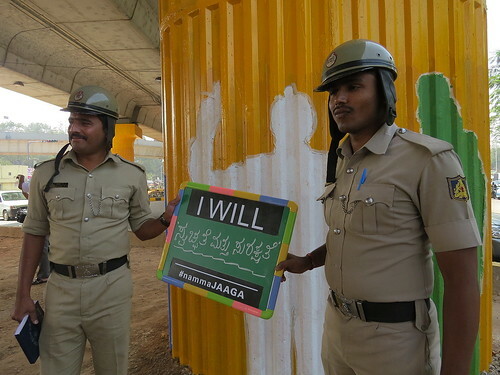 The police personnel put in a wish for cleanliness and security: I used a paintbrush, too (and am wondering how to get the stains off my top!) 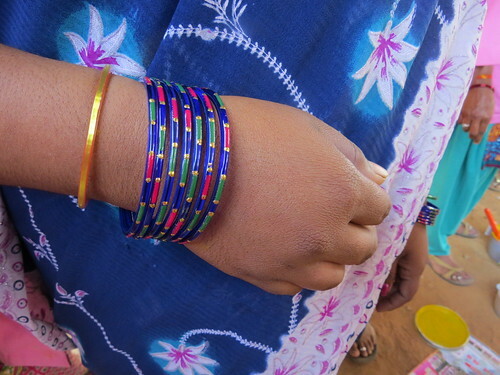 The Press came and interviewed Kamya about the event: I even enjoyed the colour sense of some of the ladies who were painting: People like Sarah from New York, associated with Jaaga, put their hands to work as well: There was plenty of photography going on apart from my work. 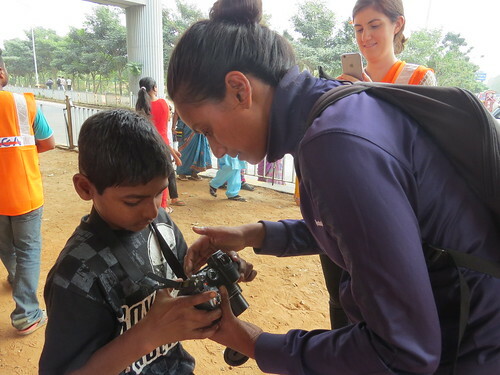 Unnikrishnan and his friend clicked each other while they painted: And this young man was intrigued by the Jaaga camera being handled by Shayona. There were a lot of group photographs as the event wound up. 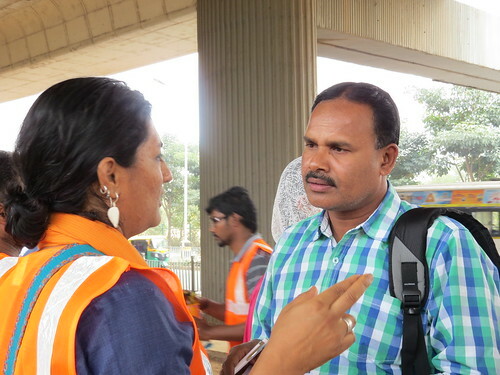 This team from BBMP brought in and served coffee, tea and biscuits, till the end of the event. 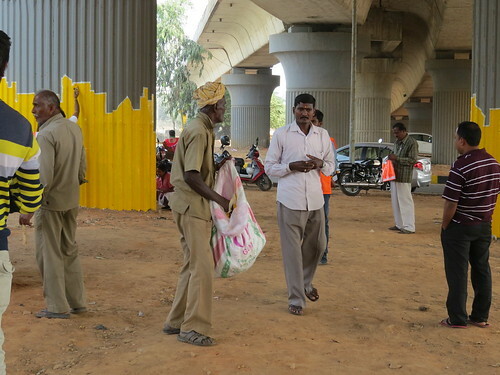 However, given the fact that it is difficult, with the heavy flow of traffic, to access the space under the flyover, and also the dust and the noise, I do wonder if this public space can truly be utlized by the citizens of our city.